Here is an interesting new release from Osprey Publishing. Author Paul Crickmore is back with more tales of the SR-71. 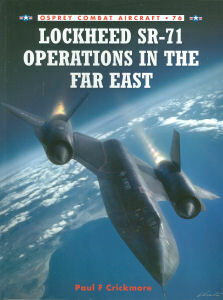 His first look was from 1987 in his title 'SR-71 Blackbird: Lockheed's Mach 3 Hot Shot', also published by Osprey. Since that time, he has released different aspects of the super secret aircraft as new information came to light. Now that the Blackbird has been offline for 20 years, clearly more background information has been released. First developed as the single-seat A-12 under OXCART, the Mach 3+ reconnaissance capability came online in 1962 and provided the CIA with the ability to reach targets that were inaccessible to the U-2. The US Air Force acquired their own version of the aircraft as the R-12, which was a longer airframe with increased fuel capacity and a second cockpit to split the workload between two crew members. The R-12 was revealed as the SR-71 by President Lyndon Johnson. The photos in this title are quite interesting, especially some from the cockpit whilst at altitude - no wonder these crew members wear astronauts' wings! The title also has some great illustrations to highlight some of the design differences between aircraft variants. The operational discussions are interesting as the author details some of the challenges as well as aircraft losses over the 23 years of operational service between 1964 and 1989. Where else can you find an aircraft that could boldly go deep into denied airspace and when fired upon, simply accelerate out of harms way? While a number of aircraft were lost in accidents, none were lost to hostile action. This book is a must have for the modeler and aviation historian interested in modern air operations. Recommended!